Should carbonated beverages be avoided? This question has been a subject of discussion of experts since the mid-20th century, carbonated drinks and juices have a bad reputation since then, but it is likely that those who oppose the consumption of these beverages are right on the mark. Carbonated, artificially sweetened drinks and energy drinks are the subject of numerous studies and discussions on health, and are considered one of the main causes of obesity in young people worldwide. Studies have shown that consuming these drinks increases the chances of developing diabetes, causes digestive problems and adversely affects the liver. As early as 1942, the American Medical Association has indicated that soft drinks should be decreased in daily use, because the same consumption leads to obesity, because they contain a high percentage of sugar. At that time, the annual production of these beverages was estimated at 2.4 decilitre per person to the year 2000, this amount increased to over a litre and a half a day. Studies have shown that there is a direct link between the increase in obesity in the world and the consumption of these beverages. Researchers from Yale University analysed 88 studies that have shown that consumption of soft drinks contributes to the introduction of calories in the body and stimulates the appetite. It is assumed that a sudden jump in blood sugar causes hunger and causes overeating. If you love to drink soft drinks, you should know that a litre of juice contains about 25 to 30 teaspoons of sugar. In the eighties of the twentieth century, due to the rise in obesity rates among men, the company that produced soft drinks and juices, have announced a new "diet drinks", with fewer calories and no sugar. These products retain the refreshing taste of the original version of the drinks, but instead of sugar used artificial sweeteners, such as saccharin, known as E954 and aspartame. Aspartame in 1981 was approved by the FDA (US Food and Drug Administration) and we now know that it is very harmful. It can cause symptoms, such as headaches, digestive problems, mood changes. It is important to point out that it breaks down in the body in separate metabolites: Phenylalanine, aspartic acid and methanol. All three metabolites directly affect our nervous system. The high level of Phenylalanine reduces the secretion of serotonin and dopamine in the brain, causing mood swings, lack of concentration, and in some cases depression, while aspartic acid increases the risk of neurodegenerative diseases. Methanol acts on the central system and damages eyesight. What happens after you drink soda? Twenty minutes after you drank soda blood sugar rises, and insulin shock ensues. 40 minutes later, the absorption of caffeine in the body is completed. The pupils expand, blood pressure goes up, and the liver releases sugar into the bloodstream. The feeling of sleepiness stops because of the blocking of adenosine receptors in the brain. 45 minutes later, the body accelerates the process of production of dopamine, stimulating the nerve centres of satisfaction. In the same way it works as a heroin, and is therefore considered that sodas, juices and energy drinks can cause very similar addiction. 60 minutes later, during ejection of phosphorus with the urine - calcium which is bound to it is secreted from the body. 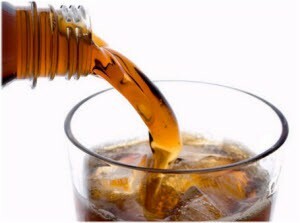 Do you know that soft drinks promote osteoporosis? Studies have also shown that carbonated drinks increase the acidity of the body, which leads to bone loss. Specifically, increased acid levels affect the balance between calcium and phosphorus in the body. Since soft drinks are rich in phosphorus, in order to establish the said balance, the calcium from the teeth and bones is used. Thus, long-term consumption of these products is one of the key causes of osteoporosis. Also, it produces kidney stones. Therefore, if you cannot give up these drinks, consume more milk and dairy product in order to compensate for the deficit of calcium and prevent further bone loss. Sodas during pregnancy are more than undesirable, avoid them whenever you can, nursing mothers in particular, should avoid them. The hypothesis that soft drinks are harmful is established, it is recommended to consume as little of them as possible, and it would be best to completely remove them from use.